In fairness, the giant had just been awakened. Still, not everyone would be able to bring down a brute twice the size of a city temple, even if it was in a stupor, so I guess I am a hero. That's not to say I'm the greatest hero or would even be remembered once I fell, but I would not turn away being called "Aesrias, the hero." I am stronger than others of my age and have always been able to easily master all manner of weapons, although for challenge I prefer to use my own fists in combat. But I boast too much. In truth I am one of many who are blessed with the might of Iroas, children of devout parents to whom the God of Victory has given the strength to serve and protect the people. Everyone always said I was born a hero. That shambling giant was an easier monster to take down than the hydra. 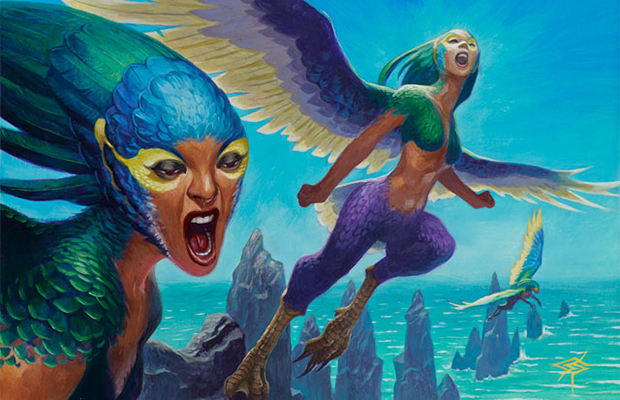 The flock of harpies was probably the worst. Giants and hydras you can punch in the head. Even a hydra, with multiple heads, only has so many as long as you don't cut them off. It was time consuming knocking each of its ravenous heads unconscious, but it was better to deal with eight heads rather than one hundred. No, the harpies were the worst to fight. This was at a crossroads in a desolate area. There was no cover save for the sparse, dead trees the harpies occupied. Word of my hydra conquest became my gravest enemy. Fighting the eight heads of a hydra did not mean I could fight eight harpies in the open. They can fly and dive in to attack, swarming me with their sharp claws. They also employed a deafening caw whenever they retreated to the air. I should have brought a sword. In the end, I killed them all, of course. I grabbed a branch from their roost tree and was able to swat the monsters to the ground when they got close, delivering the killing blow with their own perch. I did this until the last two flew away. I was cut and bloodied, exhausted from the ordeal, but it was a good fight. I took the heads of the creatures to the city of Tynthal, north of One-Eyed Pass. It is a larger city, where most of the populace lives in smaller villages or in the capital within the walls of the Kolophon. It is large enough for a permanent detachment of Stratians, the warriors of the Akroan army. Tynthal's governor, Pilun, had summoned me to deal with the harpies. I arrived at the civic temple and entered the governor's chamber where he met with citizens. There were two soldiers outside who opened the doors for me and eight more in formation in the room. I gave the harpy heads to a young attendant who tried to balance them, still dripping, in his arms. Pilun sat in a gold throne, although I suspect it was only gilded, wearing a purple and blue robe—those colors are some of the most expensive dyes in Theros. I try not to judge others by their appearance, but if I saw him in the street, not flanked by soldiers in a meeting hall, I would think he were a pickpocket. He wore a crown, which bothered me, because in Akros only Anax wears a crown. "You return to the scene of the crime?" Pilun said, not rising from his seat. His guards held spears in my direction. 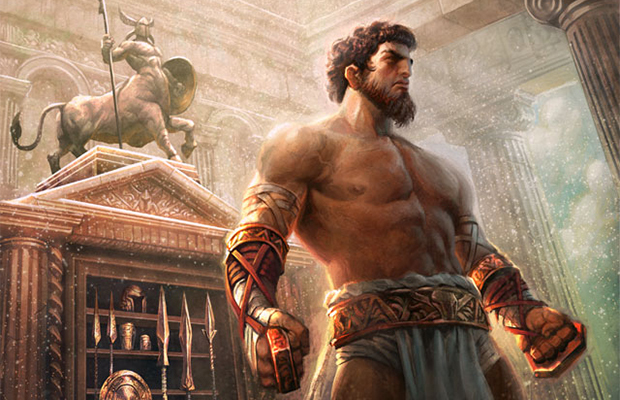 "Governor, I am Aesrias of Akros, Hero of Iroas. I came at your behest to slay the harpies terrorizing your roads." "A clever ruse, I'm sure," he said. "But there is the fact that this very day several gold coins were stolen from a merchant by a man meeting your description." Someone entered the chamber from behind me. It was an older man who wore rags, but also, oddly, bright golden bracelets and rings. He gasped when he saw me, the kind of gasp I've seen in a bad Meletian drama. He began to act like he was crying, although there were no tears. "This man attacked me, my lord. He stole my purse," sobbed the liar. "Guards, it seems we have our criminal." I ran through all of it in my head. This was wrong—the governor overstepped his bounds. There had been no trial. I came here after having fought harpies he had sent me to defeat and I was tired and weaker than usual. This was all planned. I did not have the strength to fight the soldiers, did not know if the corruption touched them or if they were as innocent as I. I let them shackle me and did not fight. I would recover and then force my way out of this madness. I did not know how to pray to Xenagos. He was the new god everyone spoke of in whispers, some pretending he had been a god since the beginning, others denying his existence. I always prayed to all of the gods, although I admit I was lax. I could rattle off, "Blessings be to Iroas from whom my strength flows and watch over me Heliod, Thassa, Erebos, Purphoros, Nylea, Ephara, Phenax, Mogis, Karametra, Athreos, Pharika, Kruphix, and Keranos." I've said this prayer since I was a child; it is hard to add a new god to the practiced plea. I now pray to Xenagos just to be safe, but I've yet to hear divine reply. Xenagos might be a new god, but he's learning how to play the part quickly. I was praying to all the gods as I was brought to jail. At least, the guards called it a jail, but I knew what I was meant for. At the edge of the city is a coliseum used for hosting part of the games. These were meant to bring the humans of the nations of the world together in competition. As I was thrown into a holding pen designed for animals, I saw others held in cages and knew I was here to partake in an ancient and illegal practice that the Iroan Games were meant to replace. I would be sent to kill or die in an arena. They left me shackled and locked me in a cell. My legs were manacled together and my wrists attached to the lower chains so I could not raise my arms. The cell was small, the bars a grid, so I could barely squeeze my hand through. There was some hay and stains of what was probably blood and urine on the stone floor. It was dark. The dim candlelight did not grant much vision. I could not see how big the room was, but I could see there were many cages like mine. I heard some men whispering, but guards walked the prison, jabbing those who spoke with the ends of their spears. I no longer had to worry about hurting the soldiers. I could also hear the grunts and screeches of other creatures in the cages. I could hear minotaurs and the screeches of harpies. I heard what I was sure were wolves and, at least three cages away, a leonin. The only other inhabitant I was unsure of was in the cell next to mine. I did not know if he could be called a man. 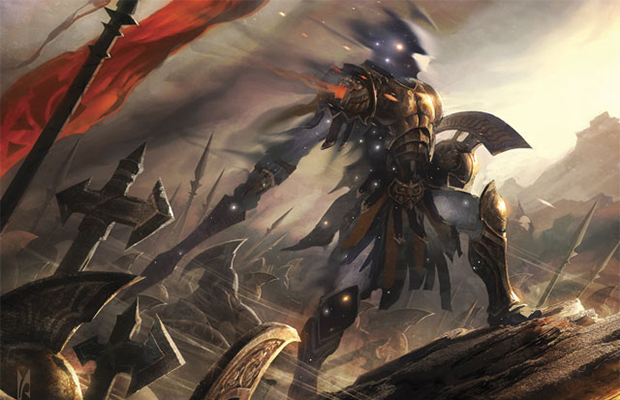 I had heard of the nyxborn, the agents of the gods walking among mortals. They were here to help, I had been told, to protect us from the monsters, but now there were more of them by the month and I was unsure of their intentions. He was not bound like I was. He wore some armor, but most of his skin—if I could call it skin—was exposed. It was like looking at the night sky. He walked toward me, having noticed me looking. The stars that made up his form were not like tattoos—as he moved the sky shifted on his skin, like he was a lens to a different place. I'm not proud to admit this, but when I saw him, I began to cry. I'd never seen the divine so close. "Are you a soldier?" he said. "No," I replied in a whisper. He tilted its head and said, "I've heard your name and I know your mother. She fell at the third battle of the Pharagax Bridge. She slew seven, although she was wounded, and shouted Iroas's name as she fought." "Did you know my mother? Were you there?" I was no longer crying—I was curious. My father never spoke about my mother's death, although her sacrifice was the reason Iroad blessed me. "I was there," he said. "I have been to many wars. Through this we are connected." "You and I both serve Iroas." "Can you not free us, then?" I asked. "You are not chained." "I cannot." He spoke slowly, deliberately. "I do not wish to be here, but I was sent to serve the governor of this city. Iroas wishes Akros secure, but this governor seems to no longer serve the true king. I am not sure what to do." "Get us out of here!" I said, raising my voice. "This foul place serves no purpose." "I can help you; you will be needed in battle one day." "I will take what help I can get, but why not save yourself?" He fell silent. The guards were walking by. Once they passed he continued. "You share Iroas's power," he said. "Come close and I can give you more of his blessing. This is something I can do." "How would I repay Iroas?" I said, hesitant. "They mean to send you against a flock of sirens. I am no god; this is Iroas's power. But it is my gift and I ask no reward." He poked his fingers, star-skin shifting, through the bars. I knew if I was still sore from my bout with simple harpies, sirens with their vocal trickery would surely do me in. I got close to the bars and he touched my shoulders. And I felt better. My wounds healed. I was no longer tired. I tried to break my bonds. The metal stressed, but it did not break. "Thank you," I told him. "There is one more favor I must ask. Can you get me one of the candles from outside your cell?" He nodded and took a candle from the wall. "What do you need this for?" he asked. "I need you to pour the wax into my ears." This was a modest coliseum. Nothing compared to the grand arenas in Akros. It could only seat a thousand and the vine-ridden walls broke away parts of the stadium. As the soldiers ushered me into the sand-floored arena, the sun beginning to rise, I saw Pilun sitting in a special, central area of the stadium. He was there with several women drinking wine as they stroked his chest. Pilun still wore the same clothing from the day before, as well as the crown. The coliseum was nearly empty. A few people dotted the seats, but most were drinking wine and feasting, hardly paying attention to the man walking to his death. I was not even meant to die for the masses. I was meant to die as a drunken diversion for a false king and his friends. Soldiers brought the sirens out. There were nine of them; all were wrapped in chains, each with one of their legs manacled at the ankle. Their bright green and purple wings were bound around them and metal masks covered their faces. As the sirens were brought into view, those in attendance put small items into their ears, as if they'd seen the sirens perform before. The soldiers took the chains attached to the sirens' legs and secured one end to a massive metal loop that emerged from the center of the arena. The soldiers nervously prepared to unlock the devices that bound the sirens' faces and wings. They all counted together, then released the sirens and ran to the arena's edge. The creatures were still connected to the chains, so when they tried to rush after their handlers, they were pulled back. They could fly into the air, but the chains would not allow them enough slack to reach the arena seats. The sirens then began to fly in the air, although some seemed slower than the others. One didn't even take off once released. I wondered how long they'd been confined. With spears to my back, my manacles were released and I was pushed forward. My handlers exited through the door we entered through. Pilun did not even look over to start the combat or recognize that it had begun. The sirens dove at me and I could see some were trying to sing. Their songs fell on deaf ears, the wax doing the trick. They came at me, diving with their talon feet first. They tried to rend my skin, but it did not break. I moved quickly, grabbing the chain of one to wrap it around the neck of another. When the first siren tried to fly away in a panic, she choked her sister to death. I pulled another two down, quickly breaking their necks as the remaining one tried desperately to claw off my skin. Their one advantage, their songs, was lost, and with the nyxborn's blessing on me they could not succeed. I felt bad for these beasts that had been caged, just as I had been. When four remained, I walked over to the loop that connected all their chains. I was able to easily break the links and held fast to the sirens. They took to the sky, carrying me with them. I'm sure those in the arena gasped or let out cries of fear or excitement, but I couldn't hear it. I wished the sirens would fly toward Pilun so I could grab that crown from his head or deliver one more strike to the pretender's face, but they flew chaotically, spinning and fighting among themselves for control. I held as they flew out of the coliseum and dipped, nearly delivering me into the side of a building, but I braced my legs and pushed outward, propelling myself to relative safety. I watched the city pass below me as the sirens, in chorus with each other, flew into the countryside. Eventually, they tired and dropped to the ground. They looked at me with a predator's eyes, but the captivity and escape had drained them of strength. I thanked them and broke their necks quickly, but I could not let their human likeness cause me to forget that they killed innocents when free. The nyxborn's magic had faded and I too felt tired and weaker than ever. I have needed Iroas before, called upon him in dire times, but why only then did I meet his emissary? And why would Iroas send an emissary to assist Pilun? The journey to the Kolophon to inform the king of Pilun's secession and my encounter with a nyxborn will be dangerous. But I still have my fists. And I am a hero, after all.